My 3-month-old Laasya Prasad was diagnosed with a severe heart disease called Congenital Cyanotic Heart Disease. What is Congenital Cyanotic Heart Disease? It is a disease that occurs at birth which causes defects in the structure of the heart and blocks the flow of blood and oxygen to the heart. This causes severe problems and can become very critical if not treated at the earliest. 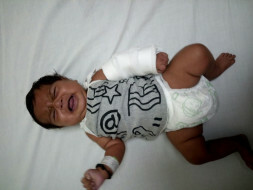 Laasya has a hole in her heart and whenever she cries she finds it hard to breathe and her fingers and toes turn blue. Laasya has been advised to urgently undergo a heart surgery in order to be treated for her condition. The cost of treatment is approximately 3 Lakh Rs. 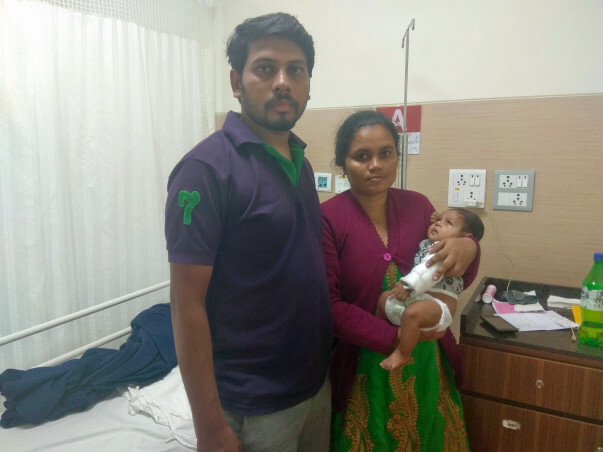 Unfortunately, I, Laasya's father, Devendra Prasad, cannot afford the entire cost of treatment and is worried that he will be unable to pay for his daughter's treatment. Baby Laasya and her mother. Her parents are willing to do whatever it takes to save her. 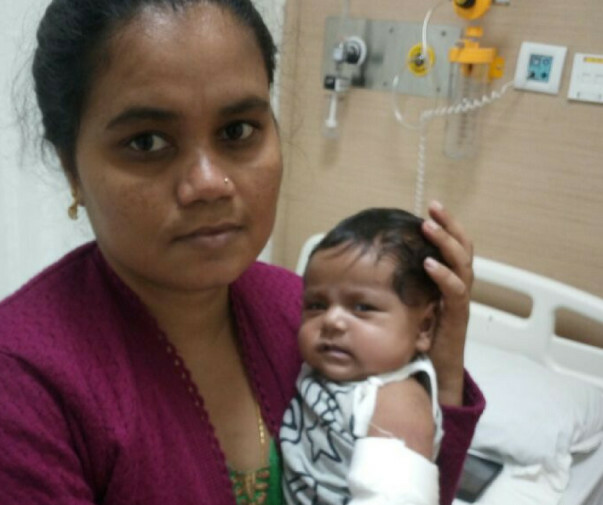 Your contribution can help Laasya get the treatment she deserves and save her life. Thank you for all the love and support you have shown Laasya. She is doing better now and is on medication. 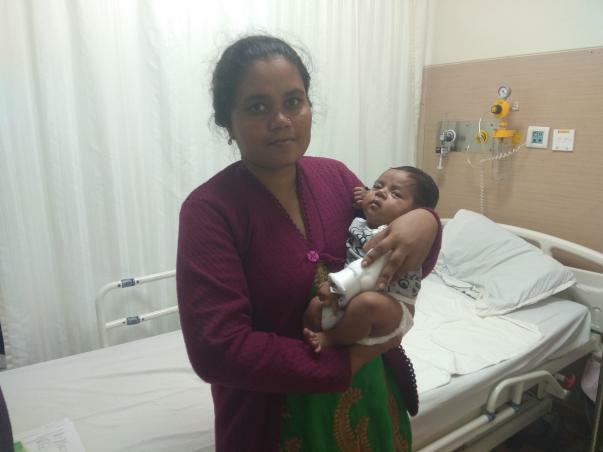 The doctors have advised the family to wait for two-three months before undergoing the procedure as she is still just a baby. After two-three months they will be deciding upon the future course of action. During this period she has been advised regular follow-ups. Thank you all once again for all the support. Please do pray for her health and speedy recovery. Will keep you posted. Here is an update on Laasya. 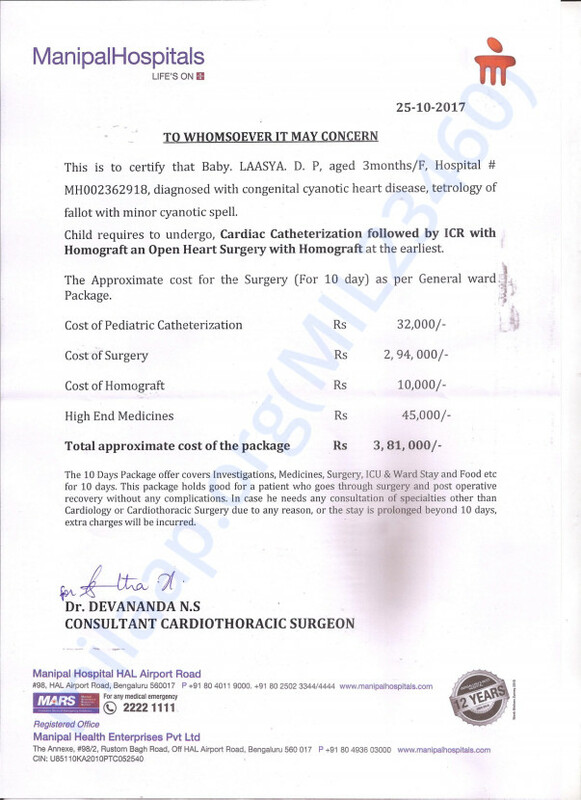 Laasya has been diagnosed with Tetralogy of Fallot and Congenital Cyanotic Heart Disease. She is undergoing medication for the same and is responding well. Currently, she is at home and is visiting the doctor every 15 days for the followups. The doctor will schedule the initial heart surgery depending on her progress. Thank you for your support and love extended. In the name of my newborn pet (Gilligan) who couldn't survive for long.